How Does HSC Scaling Work For Year 12 Students? So what is scaling and how exactly does it work? So who’s right? Do you automatically get better marks if you take better scaling subjects, or are you better off forgetting about scaling entirely and focusing on your favourite subjects only? Well, in reality, neither of these approaches are ideal if your goal is to get the best ATAR you’re capable of. The reality is a little more complicated, and to understand it, you have to understand what the Australian Tertiary Admissions Ranking (ATAR) is and how the New South Wales Board of Studies Teaching and Educational Standards (BOSTES) and the University Admissions Centre (UAC) use your school assessments and HSC exam results to calculate it. Here’s an overview of the steps in a handy flow chart. Keep reading to understand how each step actually works. So what does this all mean? Let’s break it down step by step. Throughout your final year of school, in each HSC subject you take, you’ll take a set of school assessments – typically at least three for each subject, though it varies by school. These results are aggregated for each subject and you are ranked according to your position within your year group (cohort) within your own school. Importantly, these calculated rankings depend on nothing except your performance relative to your peers at your own school. When you sit your HSC exams towards the end of the year, you’re sitting them along with everybody else taking that subject in NSW. Your performance in the HSC is initially calculated as a raw mark – that is, literally how many marks you got right out of the total marks available. Let’s say School A gives an average school assessment mark of 75 for English Advanced. School B gives an average school assessment mark of 85. However, in the NSW HSC Exam, students from School A get an average raw mark of 90, while students from School B get an average raw mark of 65. Is it fair to just use the raw school assessment marks from each school? From this example, clearly not – schools individually choose how to mark their assessments, and this has to be standardised between schools somehow. The exact statistical methods aren’t important, but BOSTES looks at school assessment marks and HSC performance between schools, and uses schools’ HSC performance to adjust school assessment marks accordingly. This means that, for example, School A’s average school assessment mark would be adjusted up to reflect stronger performance in the HSC, while School B’s would correspondingly be adjusted down. Just as school assessment marks have to be standardised between schools, HSC marks need to be standardised between subjects. We could consider a similar example to the one examined in Step 3. Suppose the average mark in Maths Extension II was 65%, but the average mark in Maths Extension I was 75%. Is it fair to compare them directly? Probably not, because Maths Extension II was probably a harder exam, so 65% in Maths Extension II might be just as good or better than 75% in Maths Extension I. Maths Extension II has a more able group of students, and the exam is made by the HSC examiners to be correspondingly more challenging. The difference between the relative strength of the candidatures in each subject is what matters here: by comparing how each subject’s cohort performs, they can be ‘scaled’. That is to say, the raw marks that a student gets in each subject are adjusted according to the strength of the candidature of that subject. 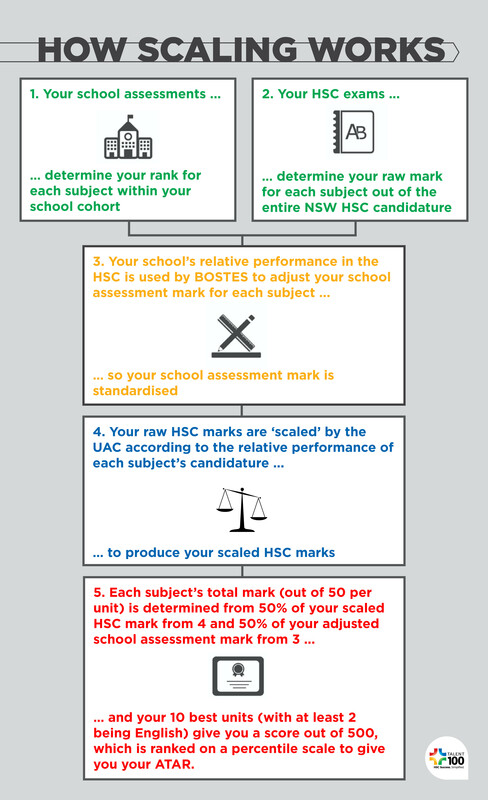 This applies to all subjects in the HSC, and the scaling process is done by the UAC. They compare the relative performance of different subjects’ candidatures to adjust your raw HSC marks accordingly. So, where does the ATAR come in? Well the ATAR (or Australian Tertiary Admissions Ranking) is calculated as follows. First of all, your scaled HSC marks from part 4 and adjusted school assessment marks from part 3 are weighted equally and given a score out of 50 for each subject ‘unit’ – so, for example, 2 Unit Maths would be scored out of 100, while Extension History would be scored out of 50. Your 10 best units are then selected (and at least 2 must be English units), and you get a total score out of 500 (which you never actually see). Now, all the scores out of 500 of everybody who started Year 7 with you (including those who never actually sat the HSC) are ranked in order, and a percentile ranking is applied to get your ATAR. So, if for example you got an ATAR of 90, that means that your score out of 500 was as good or better than 90% of the cohort that started Year 7 with you. Because the ATAR ranks everyone who started Year 7 with you, including those who never sat the HSC, the average ATAR lies around 70 (not 50 as might be expected for a percentile rank). 1. You should be acutely aware of how each of your subjects scale and adjust your studies accordingly. Most students intuitively know that easier subjects tend to scale downwards, while harder subjects like Mathematics Extension 1 & 2 tend to scale up. So, invest your efforts where they’re going to have a bigger impact on your ATAR. 2. Remember, English MUST be part of your 10 units. Even if you achieve fantastic scores in many other subjects, English can drag you down if you don’t put in the effort. Ensure to focus your attention here – don’t lose easy ATAR points! 3. The most important aspect of your school assessment is your ranking in your year. Though you can’t really affect how your school’s assessments will be standardised (since this is done on a basis of entire-school performance in the HSC), you can make sure that you’re ranked as highly as possible so you’ll benefit maximally. This means focusing your attention on improving your rankings in subjects you’re ranked lower in, rather than necessarily trying to excel even further in subjects where you’re already ranked amongst the best in your school. Remember, it’s your school rankings rather than your school marks that are important to improve. Allocate your efforts so as to maximise your ranking across your subjects – if you’re already very strong in a particular subject, gaining more marks to beat only a couple more students in your year will have a far less profound impact on your ATAR than improving your ranking many more spots in a subject where you are weaker. 4. Select your subjects carefully. Higher scaling subject can advantage you, but ONLY IF you achieve good enough marks in them to benefit from the scaling advantage. 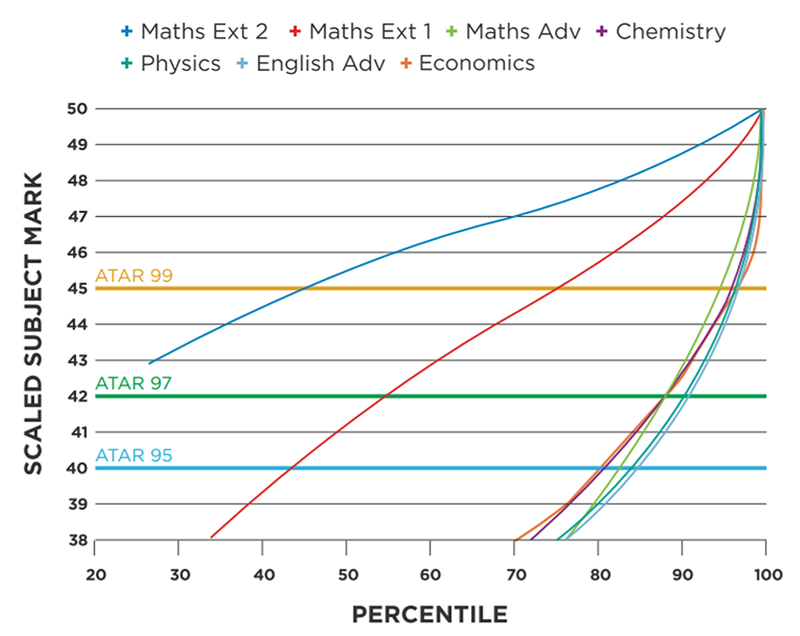 See the graph below and use our advanced ATAR Profiler to see what kind of marks you’d need in which subjects to achieve your goal ATAR. Our ATAR Profiler also lets you predict your ATAR based off current marks, check university course cut-offs, and save your ATAR Profile for you to review later – it’s a great tool and you should take advantage of it. Make sure to consider all these tips as you go into Year 12 – it’s crucial to understand how your ATAR is calculated in order to perform as well as possible.